The thermo-resistances or Pt-100, whose operation principle is based on the variation of electric resistance when temperature changes. The sensible element is a very thin string of platinum or nickel rolled on a cylindrical or flat isolated bearing. Which ohm value is defined according the international norm CEI 751, it is -100 V at 0ºC and 138,5 V at 100ºC. That's why this sensor is common known as Pt-100. This type of sensor is suitable for measuring temperature between -184ºC y + 689ºC. This sensor is protected by a stainless steel stem. The thermo-couples, whose operation principle is the thermoelectric effect, based on the generation of a tension or electromotive force because of the difference of dilatation coefficient between two different metals united in the same circuit. The most common thermocouples are the K type (Ni Cr - Ni Al), due to the wide measuring range (-200ºC to + 1250ºC), type J (Fe - Cu Ni) range 0-760ºC, suitable for corrosive environments. The S type (Pt 10 Rh-Pt) is recommended for temperatures up to 1700ºC. This resistance (V) or tension (mV) parameters are driven to a digital indicator (IDT), where are traduced to ºC or ºF by means of a display. Frequently other output signals are used (0-20 mA, 4-20 mA, etc). For that purpose exists output signal converters, previously calibrated, usually mounted on the connection head. Sensor type: Depending on temperature. Thermo-resistance (3 wire, 2 wire upon request) or thermocouple. Stem: Length and diameter depends on application. Supplied in stainless steel and others upon request, such as Monel 400, Hastelloy C-276, Inconel 600, Titanium, refractory steel AISI 310, etc., as well asPTFE or ceramic. Extension neck are available if required. Thermowells and extension necks are also available in order to avoid damages caused by erosion, corrosion, abrasion and high pressure processes. Head connections: Not specially required, temperature sensors can be supplied with a flexible silicone cable. 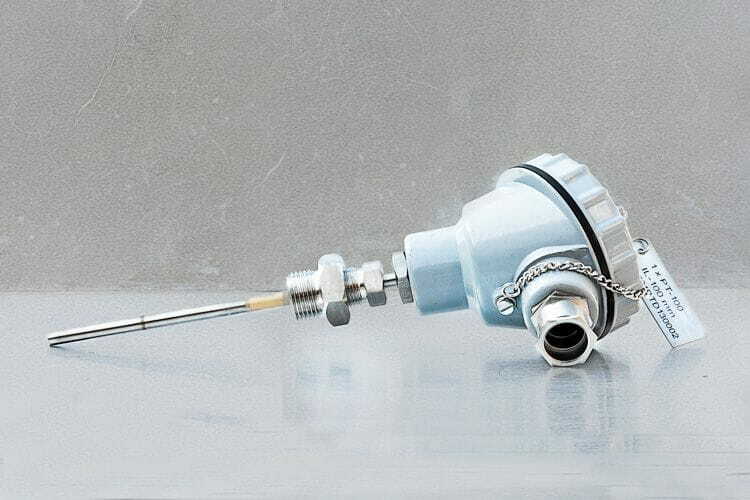 When required temperature sensors can be supplied with a wide variety of connection heads: die cast aluminium case DIN-B or DIN-A, plastic case BBK , screwed top aluminium case NEMA IV, explosion proof cases, etc. Process connection: By means of a fix or adjustable thread, flange or bayonet type.